There is really a lot to do in Tenerife! 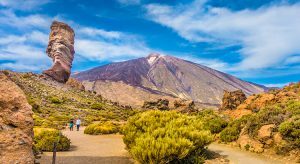 There are at least three things we think you should do during your stay in Tenerife: visit El Teide National Park, take a walk (in the Anaga Mountains or some other beautiful spot) and have a meal at a guachinche. Hike in the Anaga Mountains. Truly beautiful, it also offers shelter in case of very warm weather. Walk to Taganana …, as if time has stood still there. Take water and some snacks and stop occasionally along the way. Get on the road in time, park your car in Los Gigantes and take the bus or taxi to Masca. Walk down the descent and take the boat back to Los Gigantes. It is pretty descending and not a very easy walk (about 4 hours), but it is very worthwhile. Visit El Teide National Park. We did the Sunset tour and despite it being quite touristy, we are still impressed. Book in advance because the tour is popular. Watching dolphins from Los Gigantes also remains a very special experience! There are plenty of suppliers there, but we are very satisfied with the smaller boats from Masca Express. They make a ‘swim stop’ along the way. Go a day (or a half) to Garachico. Beautiful village with natural pools. Book a wine-tasting and en mojo workshop at Bodegas Monje in El Sauzal. The wine from the North is the best, and it is extra fun to do if the weather is a bit disappointing. El Médano is definitely worth a visit. It is the surf spot of the island, which makes the atmosphere relaxed. If you are adventurous, go paragliding. We do not have the courage, but it looks great. There are also great places to go climbing, to dive and to mountain bike. Book the guided tour through the 18-kilometre Cueva del Viento in Icod de los Vinos. This 2-hour tour is beautiful, less suitable for those who are claustrophobic in nature.